Q. WHAT IS THE TIME AND PLACE OF DEPARTURE? A. This year TWB (2019) will have four programs. The first program should plan to arrive between 9:00 a.m. and 9:15 a.m., Saturday, June 15th, the second program should plan to arrive between 9:00 a.m. and 9:30 a.m., Monday, June 17th, the third program should plan to arrive between 9:00 a.m. and 9:30 a.m., Saturday, July 13th and the fourth program should plan to arrive between 9:00 a.m. and 9:30 a.m., Monday, June 15th. 11400 Mallard Creek Rd Charlotte, NC 28262 (15 miles north of Charlotte, N.C. on I-85, Mallard Creek Exit.) Some years the Community House is closed so make sure you go to the restrooms before arrive. You will see a large white building and the bus, vans and trailers parked near it, which is right off of Mallard Creek Rd. Please park in the grassy area to the right of the white building for both send off and return. Checking everyone in may take up to an hour so make sure that you bring a chair or something to sit on. Telephone the TWB line at (704) 662-8666 if you have difficulty or are delayed. Please allot extra time for traffic. Q. WHEN AND WHERE WILL WE RETURN? A. Trip #1 returns at 5:00 p.m. at the Mallard Creek Presbyterian Church Community House, Sunday, July 7th, Trip #2 at the same location as send off on Tuesday, July 9th, Trip #3 at the same location as send off on Sunday, August 4th, and Sunday, August 6th. Please allow for traffic. Q. ARE PHYSICAL EXAMINATIONS REQUIRED? A. No, but strongly suggested. The tour is physically demanding. It covers areas of extreme temperature changes. Should you become ill, all possible efforts will be made to give you the best of medical attention. In the event that you�re unable to continue traveling, arrangements will be made to fly you home. Please advise us on any history of medical problems that might reoccur during the trip. Participants are allowed to bring prescription drugs that they can administer themselves. Q. WHAT ABOUT SPENDING MONEY? A. $350-$400 is suggested along with a boosters from home deposited in the participants debit card account during the trip. Debit cards are great means to carry your funds. If possible, have a duplicated debit card made and store it in the bottom of the participant�s duffle bag. Q. WHAT SHOULD YOU BRING ON THE TWB EXPERIENCE? A. A suggested clothing/materials list will be sent. Please try to stay within the given items. The duffel bag should be no larger than 30 inches long and 13 inches high and should NOT have rollers on it. PLEASE REMEMBER TO MARK ALL CLOTHING WITH YOUR INITIALS. Also, bring a small pillow, tarp for a ground cover, sleeping bag (30 degree rating is fine) and sleeping pad (no thick foam pads or air mattresses). Flashlights are great on those late night walks to the bathroom. You will need a 20-32oz water bottle for use during all meals on the trip. Please decorate or label it so it is easy to identify. Most importantly, bring with you a sense of humor, an eagerness for involvement with people and a desire to know your America. Q. WHAT SHOULD YOU NOT BRING ON THE TWB EXPERIENCE? A. Participants should not bring cell phones or Wi-Fi devices but are welcome to bring calling cards or call using collect. We will have access to "TWB Phones" after the 5th day of the trip. Pocket knives, expensive jewelry and electronic games are discouraged (MP3s players are okay, they cannot have Wi-Fi capabilities though!). Q. SHOULD YOU MAKE ANY PREPARATIONS FOR THE TWB EXPERIENCE? A. The amount of foreknowledge you have as to places we shall visit will have a direct bearing on how meaningful the trip will be for you. Especially good books are "America and American" and "Travels with Charley" by John Steinbeck, "A Walk Across America" by Peter Jenkins, "Dateline America" by Charles Kuralt, and "National Parks" by Freedman Tilden. It will also be helpful if you can give some forethought into the varying types of camping meals that you can prepare. You and thirteen others will plan a meal preparing for eighty-eight people. Q. HOW SHOULD THOSE WISHING TO WRITE YOU DURING THE TWB EXPERIENCE ADDRESS THEIR CORRESPONDENCE? A. Since TWB 2019 is conducting four trips this summer; we will have two separate mailing addresses for each session. For the June 15th and July 13th trips one should send letters to: Your name, c/o Teens Westward Bound, 40064 Hwy 49, Oakhurst, California, 93644. Mail pick-up is June 27th for the 1st trip and July 25th for the 3rd trip. For the June 17th and July 15th trips one should send letters to: Your name, c/o of Teens Westward Bound, 8470 W 2700 S, Magna, UT 84044. Mail pick-up is July 1st for the 2nd trip and July 27th for the 4th trip. . At all mail sites they should endorse "Hold for Arrival". If someone is thinking of sending you a care package, please inform him or her that it should be no larger than a shoebox. Mail that is sent after June 21st for the first trip, June 24th for the second trip (by regular mail), July 18th for the third trip and July 20th for the 4th trip will probably not be received in time for pickup. Please only send mail via the USPS, not through UPS or FEDEX. The post office does not accept these carriers. 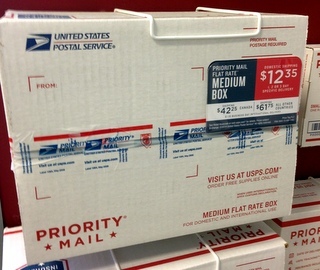 We recommend getting the flat rate box from the post office. Q. WHAT IF THERE IS AN EMERGENCY AT HOME DURING THE TWB EXPERIENCE? A. An emergency number will be given out at Mallard Creek Presbyterian Church Community House the day we leave. For emergencies call that number and TWB will check this line early AM and late afternoon. For non-emergencies, call the TWB line at (704) 662-8666. If no one answers, a message should be left on the answering machine. Q. WHAT IF CIRCUMSTANCES ARISE THAT MAKE IT IMPOSSIBLE TO GO ON THE TOUR? A. Please advise immediately. If your place can be filled from the waiting list, a full refund less the deposit will be issued. If not, there can be no refund. Q. WHAT ABOUT SPORTSWEAR WITH "TEENS WESTWARD BOUND" ON IT? A. You will be given (as part of the trip cost) a TWB T-shirt. If you wish you can purchase our light weight fleece, (New) spirit jersey, cap, and sweatshirts. They are sold at cost and can be ordered on the enclosed blue form. The fleece generally run true to size and the all cotton sweatshirts readily shrink. All TWB Sportswear is gray, white, and red. Q. DOES THE CUSTOM MOTORCOACH HAVE A STEREO CD PLAYER AND DVD? A. Yes, but our only music will be the music you and others bring. Please prepare "Clean" playlist on your MP3 player. Limit two DVD�s per person. Don't forget to bring your favorite movie! Please no �PG-13 or R� rated. A. We will make 3 laundry stops. Participants will be responsible for doing their own laundry or paying the Chinese laundry in San Francisco. 1. A college Master�s degree in Instructional Technology. 2. 18 years working experience with young people. 3. 17 years in travel camp directing. C. The first program tour director (Josh Kerns) was a TWB participant in 2006 and has been a staff member for the past 5 years. Josh graduated with his Bachelor�s from the University of North Carolina at Greensboro. His experience as a middle school teacher allows him to bring a positive approach to leading young people. The second and fourth program tour director (Vicky Wilkins) has been traveling with Teens Westward Bound since 1980 (37 years). She is a graduate of University of North Carolina at Chapel Hill and has taught in the Lee County Schools for 41 years. Vicky is certified in First Aid and CPR. In addition to TWB travels, Vikki has spent many summers traveling around the world and has traveled to 38 states in the United States. The third program tour director (Dallas Godbold) was a TWB participant in 2010 and has been a staff member for the past 4 years. Dallas graduated with her Bachelor�s from the University of North Carolina at Greensboro. Her experience as a teacher allows her to bring a positive approach to leading young people. E. All staff is available on a 24-hour basis for the duration of the trip to meet the mental and physical needs of the participants at whatever the personal sacrifice. F. The staff uses a non-directive, permissive approach in dealing with participants. The directors may limit the freedom of a participant in cases where such freedom infringes on the rights of others. G. Teens Westward Bound has a zero tolerance for the use of tobacco products, alcohol or illegal drug products. Participants involved in such activity will be sent home immediately at the expense of their parents. Participants should not bring cellphones or Wi-Fi devices with them on the TWB Experience. There will be "TWB Phones" to use after the 5th day of the trip. A. A specially designed 2018 Van Hool motorcoach is used for transportation. 1. Motorcoach is owned and operated by Premier Transportation of Knoxville, Tennessee. 4. The Motorcoach is loaded with accessories such as: am/fm stereo system, air conditioning, PA system, CB radio, DVD Player, bathroom and 110 volt plug at each seat for charging devices. B. The 2019 Ford Vans are fully loaded and leased from Capital Ford in Raleigh, NC. 2. The counselors, tour directors and the program director will do the driving of the vans. C. Camping equipment includes: 10 by 16 foot tents, propane cooking stoves, traveling propane tanks, cast iron cooking equipment, eating utensils, and propane lanterns. A. The "buddy system" is applicable at all times especially during independent touring and swimming.